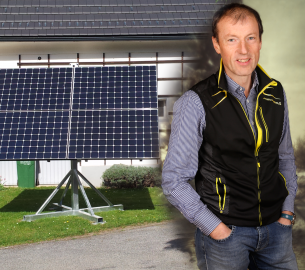 GS Technik is an Austrian company with the mission to guarantee energy self-supply through solar energy for every household. 1. We are a customer oriented company and we are committed to our clients. It is our company goal to try to meet their expectations in best compliance with the applicable legal and economic environment and the ecological and social demands of our contemporary world. 2. Our employees are the greatest value of our company. We want satisfied and motivated employees, who are proud of their performance and their company. This is only possible in a climate of openness, trust, cooperative teamwork and maximum communication. It is the responsibility of the management to ensure this through motivation and exemplary behavior and the investment in the development of its employees. 3. We are innovative and try to improve ourselves in an ongoing manner, while identifying new customer needs and immediately adapting our products and services accordingly. 4. We are committed to play fair in the marketplace in the spirit of partnership not only in regards to our clients but also to our business partners. 5. We need to make profit, which helps us ensuring the long- term development of our company and therefore the jobs of our employees.